Have your pretty, freshly painted nails chipped again only 2 days in? There’s another way to get nails that will not only look shinier, but they will stay in perfect condition for up to two weeks. And that’s all without having to do a trip to your local salon. The magic solution is choosing acrylic powder or ‘dip powder’ for nails. Powder nail polish is usually associated with acrylic nails as the acrylic plastic is formed when a polymer powder reacts with a monomer liquid. 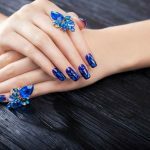 However, creating a full set of acrylic nails takes time and patience, on top of that they’re difficult to pull off at home unless you’re a trained nail technician. The same goes for gel nails, which will also give you a long lasting shine but require curing under a UV nail lamp after every layer. If you don’t want to go full acrylic you can opt for an ‘acrylic lite’, which is what dip powder nails stands for. So what’s the difference, and should you still go for a full acrylic? This year, dip powder is more popular than ever. It’s been a life saver for anyone who doesn’t have the time to go through the paces of acrylic and gel nails (as well as the maintenance after). Also called SNS powder, dip powders are refreshingly simple to use. You can get a powder manicure done at the salon or you can easily attempt it at home. The process is similar to any other manicure. First you start by cleaning, trimming and buffing your nails and pushing back your cuticles. Then you apply a base coat. After this your nails are dipped into the SNS pigmented powder. The process is usually repeated to ensure that enough color is transferred on the nails. A simple brush is used to wipe away any excess from the fingers. Then a top coat is applied – and you’re done! There’s no need to wait for curing under a UV light unless you’re looking to incorporate other design elements, such as nail art. When done right, the staying power of dip powder is several weeks. That puts it on par with your average acrylic nails. The removal process is the same as for gel nails, all you need to do is to soak your nails in pure acetone. This is a question that often gets asked about powder nail polish. If it’s using the principles of acrylic nails, isn’t it worth just going for the classic acrylic manicure? My opinion is that dip powder has something different to offer. Yes it’s still very new, and you may find it messy to do at home if you’re unsure of the technique. But once you get the hang of it, you’ll love collecting all the bright, sensational powders being brought to market. It’s also worth trialing an SNS powder manicure at the salon if you want to know how it suits you. This trend won’t be going anywhere anytime soon.